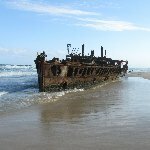 Fraser Island is a beautiful island on Australia's east coast and definitely a popular backpackers destination. I found out about Fraser Island when I was in Torquay, the surfers capital of Australia and a really laid back town filled with young people from all over the world. I started hanging out with a group of English guys who were planning a ferry trip to Fraser Island and asked me if I wanted to join them. From Torquay we rented a 4WD jeep and drove south to River Heads,near Hervey Bay, from where a direct ferry took us to Kingfisher Bay on Fraser Island. I was so relieved that we rented the bigger 4WD vehicle when I saw the road conditions on Fraser Island as in they're simply non existent..Not really thinking about how the road would be on the island it even passed through my mind to drive up there with a normal car. So glad we didn't! Fraser Island is literally what it promises, an island and without asfalted roads but with gorgeous white sandy beaches, both on the island shores as in the heart of the island what makes it accessible for high level 4WD vehicles only. We did help out some tourists who got stuck in the sand causing their back wheels to start spinning along the way and they clearly expected a less rough journey. In the end they were fine and we could start our Fraser Island adventure. We stayed at Fraser Island Backpackers, the only hostel on Fraser Island and a busy place in high season. 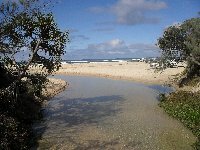 We spent a great two days on Fraser Island and enjoyed the many gorgeous beaches all over the island. I even spotted two dingo's which was pretty exciting as we had seen so many signs around the island telling us to wath out for the wild dingo's that I really wanted to spot one! The weather was great and we had no real problems with our vehicle which was also nice. Just one time we were just in time for a refill at the local gas station and a snack at Happy Valley where you might find some other types of accomodation. 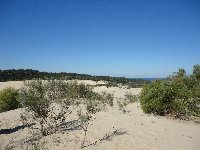 Did you enjoy Fraser Island 4wd Tour and have you been on a holiday in Fraser Island, Australia?